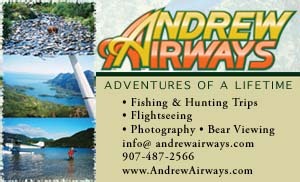 Location: 17.5 miles northeast of Anchorage on the west bank of the Knik Arm of Cook Inlet; 13 miles south of Wasilla. Population: approximately 270. The town of Knik is beautifully situated amid breath-taking mountains, tidal waters and Knik Lake. The original townsite of Knik was first inhabited by Athabaskan Natives. During the first census in 1880 the entire valley was populated by fewer than 200 people. In 1900, Orville Herning arrived in Knik, hired by the Klondike and Boston Company to open a trail to the Willow Creek Mining District. By 1905 Knik had its own Post Office, two stores, a roadhouse and several cabins. The Knik town site is listed on the National Register of Historic Places. Two buildings remain standing—the pool hall, which is now the Knik Museum and the Bjorn cabin.